Assassin’s Creed Odyssey has slowly expanded since release with live events and new monsters to fight. These activities and challenges give a sense of continued danger to the Grecian world, but a smattering of new quest has been the most surprising and exciting new additions. The new “Lost Tales of Greece”—two of which have been released, with more to come—aren’t flashy, but they’ve provided a lot of great moments. The first two missions have covered silly theater plays and mysterious (and maybe mystical) matters of divine intervention. They’re stories that build upon the world and culture, giving more depth than simply tossing a cyclops on the map. The first Lost Tale, “The Show Must Go On,” came out November 1st. It focuses on the playwright Thespis’ attempts to create a play about King Leonidas. Kassandra (or Alexios) needs to wrangle wine for the audience and find Thespis’ missing actors. It could have been a simple fetch quest, but there are opportunities to make some pretty silly choices that can sabotage Thespis’ efforts if you want. For instance, is it worth helping a timid but skilled actor return to the production, or will you simply hire the stout mercenary extorting him for money? The play needs an intimidating general, and either will do. There’s even a riddle sequence where you need to find the real actor among a group of cultists who all have taken on the same name. Maybe you find him, maybe you don’t. Either way, the show must go on. These small opportunities to affect the quest’s outcome are fun, but the real joy is getting to see Kassandra assume the role of her grandfather Leonidas. Thespis’ script is full of errors and embellishments, but once you’re on stage it’s possible to diverge from the script for something more accurate. Whether you make a masterpiece or a bumbling flop, the quest offers chances to roleplay and to see the stranger side of ancient art. 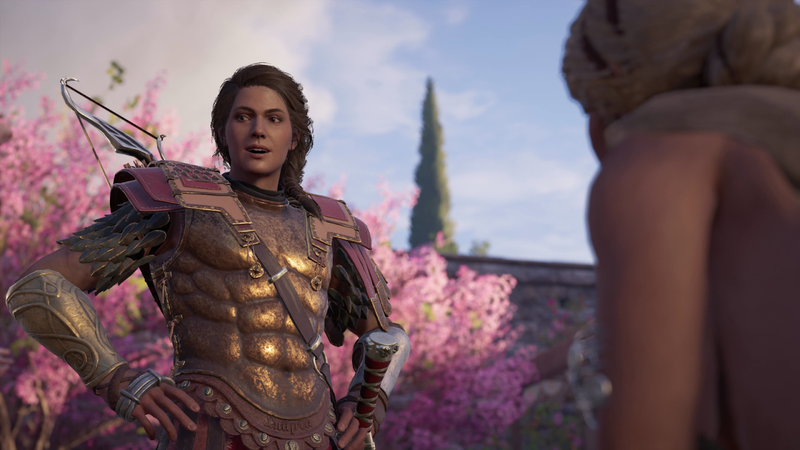 This contrasts nicely with the second quest, “A Divine Intervention.” In this quest, a mysterious woman sends Kassandra on a variety of tasks that include a test to decide if Apollo or Poseidon is the most dangerous god. If the former, you need to dispatch of some rampaging lions; in the latter, you help a pirate deal with mercenaries attacking a village. Each quest has violent and non-violent solutions that, while simple, allow for some roleplay. As you continue, the quest-giver becomes more mysterious and seems to know a lot about you. Is it simply because she’s smart and has resources, or is there something more godly at play? It culminates in a conclusion that provides a chance to round out your character’s relationship to myth and the gods. The Lost Tales of Greece don’t radically alter the world or add new areas to explore, but they do allow players to engage with more aspect of Grecian society, such as theater and religion. They’re not extensive, but they’re more substantive than I expected. If you’re running out of cultists to kill or beasts to battle, you should definitely check them out.